Hi I’m Andrea, and I work at The London Edition Hotel. Today I will be making the cocktails in the Punch Room, one of the 3 bars at the Edition hotel. Everything for me started thanks to the family business in Sardinia. I was introduced to the art of Italian bartending and coffee making and made and tasted my first coffee when I was 12 years old. My house was over the bar and I took my breakfast with the guests. My Dad wanted me to succeed and pushed for me to avoid this industry. 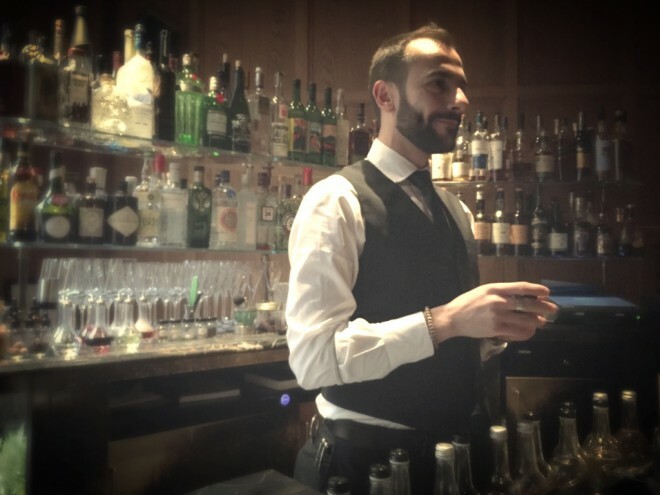 But when I finished my graduation, I knew that the only thing I wanted to do was to be behind a bar, it was my passion and I wanted to improve myself day by day. So I started to travel, first in Spain, then three years ago I came to London. That’s the good thing with this job, you can meet so many people and move easily. You need to have good conversation skills, that’s core for a good bartender, then you become your own trademark and people recognise you. You become a friend to your clients and that’s what makes this job amazing. A bar should be like a living room where you accept all the guests and try to make them feel comfortable. In big cities, people are looking for a place where they can chill out, so I would like more of an old school living room where people can sit down… a warm place with warm colours. They can take their time to choose what they really want to create a good memory. The room would be split in two parts, the first, bigger and more mainstream. Then if the guest is happy and wants to try something different, you have a second smaller bar where he can try something more precise with premium products. So two different areas where you can really take care of the guests properly. I usually go to places open late after work like the Blind Pig where I used to work. I still love this place. It’s a place where everything is all together, crowded and funny or the perfect place to take a girl. Otherwise if it was to grab a beer with friends, it would be El Camion. When it’s about hotel bar, it’s more about Artesian or the Savoy. I have always been a Manhattan kind of person, so of course whiskys, rye or bourbon. The more you know about the products, the more you can play with them. Originally most of the classics were made with strong ryes, so bitters, fortified wines like vermouth or dry fino sherrys can make the flavour profile totally different. I am constantly trying different combinations and finding new says to improve. Skill and curiosity. It’s about knowing international products and their history. Making things better and better from classic recipes. You twist the ingredients and build something new according to your personal taste and knowledge. I know many bartenders and we constantly discuss and share our own experiences. Bartenders think more about the quality of the products that they use and this is why so many small batch distilleries have appeared. Barmen actually are shaping the market and it’s becoming something bigger. Now it’s about craft gin, craft liqueurs, craft vermouth from Italy. So we are all improving day by day to create the best cocktails possible. I believe in the power of the presentation of a drink. A good garnish is an important as the ingredients in a cocktail and can make the difference. When you are a guest, you need to be introduced to the drink, so you try to make it as beautiful as it can be. You make everything like it’s for your mum. The garnish should complement the glass. If it’s a coupe, I like to use the curve, it should be a continuation of the glass and nothing pretentious. If you want to try something particular with a warm atmosphère there is a tiny bar in Sardinia called American bar Biffi. It was a speakeasy before it became mainstream. It’s simple, they have good cocktails and a good selection of spirits.